For many years I have been concerned about the serious misunderstanding that is generally called the Diet-Cholesterol-Heart Hypothesis. This indicates that coronary heart disease (CHD) is due to cholesterol in the blood, which in turn is due to cholesterol in the diet. We now know that this is not correct. Initial research was not of good quality and has been misinterpreted but it has become engrained in “popular wisdom”. It remains the paradigm at the present time, wrong as it is. The observation that CHD took the form of an epidemic during the latter part of the 20th century indicates that diet could not realistically have been its cause. There was no major change of diet between 1924 and 1970 that was suddenly reversed after 1970. A low fat and cholesterol diet is not of demonstrated benefit. What led to this misconception? The first observation was made by pathologists at autopsy examination. It was noted that cholesterol was present in large amounts in the walls of the arteries, obstructing blood flow. The cholesterol was mainly in large white cells called macrophages (= big eaters). But where did the cholesterol come from and what was it doing there? The assumption was that it came from the blood and from the diet. Diet had to be investigated in detail as cholesterol in food appeared to be very poisonous, responsible for many thousands of premature deaths. The arteries that supply the heart muscle are the coronary arteries. They form the “coronet” of arteries on the surface of the heart and they supply blood to the heart muscle. When they block completely the person can become very ill or die suddenly, the result of myocardial infarction (MI, heart attack). It has been incorrectly assumed that cholesterol is simply deposited from the blood, and that it turn it originates in the diet. It was as though the arteries “furred up” with cholesterol in a physical process. However rather than being deposited on the lining of the arteries, the cholesterol is within the wall. But the “furring-up” idea of the “diet-cholesterol-heart hypothesis” has dominated thinking during more than half a century. Even though it is clearly wrong it seems to be impossible to shake it off. The reason for this is that there is no strong competing hypothesis: if CHD is not due to diet then there is only a big question mark. No-one likes too much uncertainty and a false hypothesis continues in the absence of an alternative. The expectation of CHD being due to cholesterol in the diet led to The Seven Countries Study. This was a monumental observational study undertaken by Ancel Keys of the University of Minnesota, initiated in 1958, conducted for about fifteen years and published in 1980. Although ambitious it was not as carefully controlled as would be expected today. It was very much opportunistic depending on an international network of interested physicians. The underlying hypothesis (the null hypothesis) was that animal fat was the main cause of CHD. The clear objective of the study was to “prove” this, whereas the scientific method should have attempted to “disprove” it. It was designed to look at population characteristics in various countries, comparing dietary patterns with death rates from CHD. Such an epidemiological studies, observing who gets the disease, is the main way of identifying possible causes. 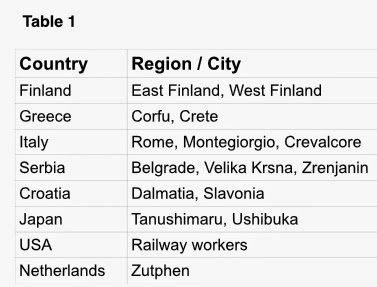 A list of the “Seven Countries” can be seen in Table 1. The study was undertaken at a time when Serbia and Croatia were all part of the nation of Yugoslavia, before its traumatic fragmentation. Five of the seven original countries studied are in Europe, with recruitment of subjects from defined locations allowing geographical comparisons. Two city locations were in Japan, but again defined locations. The other country was the USA, where railway workers were the subjects. Without a defined location this group did not add anything and can be ignored. The independent US Railway Workers Study was originally designed to make comparisons of various rail occupations having different levels of physical activity but was later incorporated into the Seven Countries Study. The subjects were people of different occupational and social groups and they could not be standardised. For example in Belgrade they were university staff, and in other countries manual workers, not strictly comparable between nations. 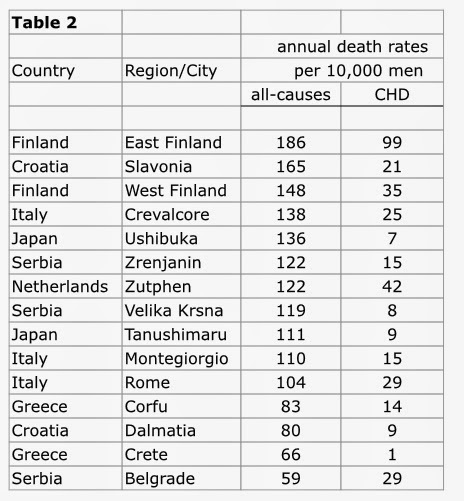 The main results showed that total deaths and CHD deaths in particular tended to be highest in northern European countries, shown in Table 2. The subjects in East Finland had the highest death rate. Dietary factors were recorded, concentrating on dietary fat. 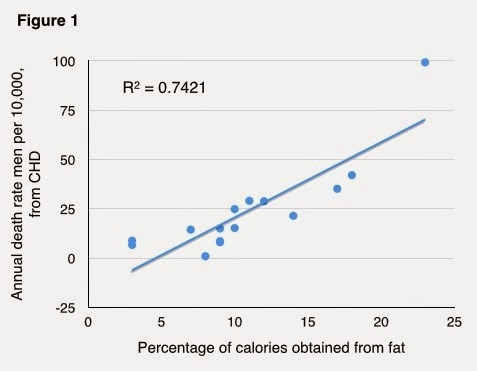 Table 3 shows the proportion of dietary calories that were fat. We can see that, like deaths, the highest tend to be the northern European countries. We can record this graphically on a scattergraph, Figure 1. Each point represents a single geographical location, the position of the point being defined by the death rate from CHD and the proportion of diet that comes from fat. We can see that the points lie close to a trend-line that slopes from bottom left to top right, meaning that the association of the two variable factors looks good. The statistic R2 = 0.7421 gives an indication of the strength of association, close to 1.0 indicating strong association and close to 0.0 indicating no association. 0.7421 indicates quite strong association. 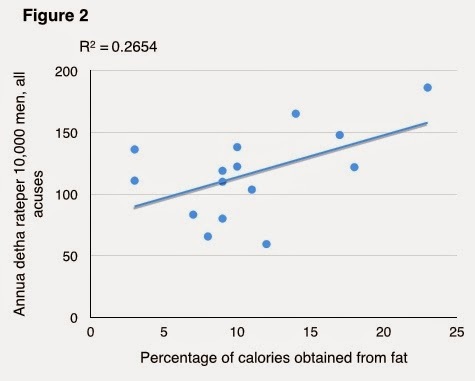 Figure 2 is another scattergraph, this time showing the relationship between total deaths and fat intake. The scatter points are now not as close to the trend-line, indicating a weaker association. This is also shown by a much lower R2 at 0.2654. In other words fat intake seems to specifically associated with CHD deaths rather than overall death rate. 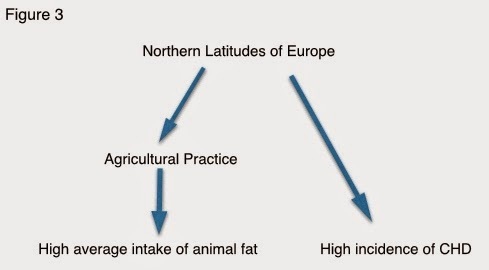 It is important to remember that association does not necessarily indicate a cause–effect relationship, but this result of the study was interpreted as evidence that a high fat diet was responsible for the high age-adjusted death rates in northern Europe. 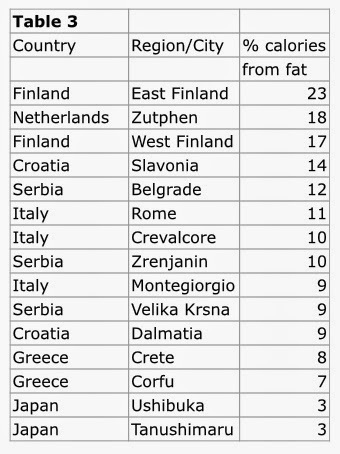 We can hardly expect the reverse, that death causes a high fat diet, but it could be that there is something about northern Europe that leads to both a high fat diet and also to a high death rate, especially from CHD. This was not considered at the time, but there is a geographical factor. Death rates from CHD might be greater with greater distance from the equator, and latitude also determines agricultural practice. The type of food produced is very different in the southern European Mediterranean countries than in those in northern Europe. It is now clear that adjusting diet with reduction of fat intake has no demonstrated effect of CHD death rate. Could it be that high fat intake is just a risk indicator for the climate-related geographical variation of CHD death rates? This will be discussed further in a future Post, to appear shortly. It's actually downright insulting for these snake-oil salesmen to push their products on you! However, they are so well put together! It's really a psychological game and these companies play it so well.